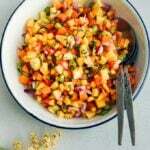 This juicy and spicy Fresh Corn Peach Salsa is a great recipe to bring summer on your table. Thanks to tangy garden tomatoes, hot peppers and red onion, this is not an overly-sweet salsa. Perfect on chips, chicken, fish or even in sandwiches. Summer is a wonderful season because we have lots of fresh fruit and vegetables around. That’s why I think it is the best time to make salsa. You can make it with anything you like. I combined whatever we have on hand to pair with our favorite Lamb Shish Kabob Recipe and made this amazing Corn Peach Salsa. This salsa is full of flavors that go really well together. In order not to end up with a too sweet fruit salsa, I didn’t use very ripe or soft peaches. Just one juicy ripe peach was enough, so do the same if you are not a fan of sweet salsa recipes. It turned out really great. As tasty as our ultimate tomato salsa aka Turkish Spicy Ezme. I think this peach salsa can easily replace spicy ezme at kabob restaurants if it is given a chance. Peel and dice the peaches. Combine them in a medium bowl with diced tomatoes and red bell pepper. I love some heat in my salsa and green chilli pepper is mostly my number one choice. Jalapenos work fine too. No need for removing the seeds if you love it hot. Use a type of sweet green pepper if you are not much into hot salsa. 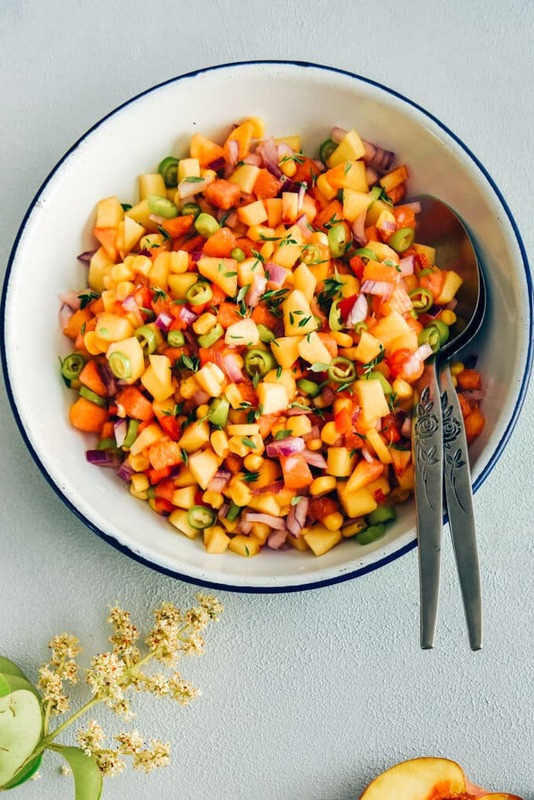 Another ingredient that balances the flavors in this peach salsa recipe is red onion. It gives a nice crunchiness too. Dice it and add in the bowl. Finally, I used fresh thyme as an aromatic herb because it was what we had. Other herbs like cilantro, parsley, dill or rosemary would go well too. As for the dressing, I prepared a simple one with lemon, salt and olive oil. Whisk these together and pour it over the salsa. Give it a good stir and serve. Can I use canned peaches for salsa? You can make the best peach salsa with fresh peaches, so I don’t recommend canned peaches. This recipe uses a combination of soft and hard peaches which are not over-ripe. If you love salsas that are sweet, you can definitely use canned peaches. Just make sure you drain them well. Although it is great with chips, we don’t always have it in this traditional way. Have you ever used salsa in your sandwiches? One of our favorite ways to eat peach salsa is in sandwiches like this Avocado Chickpea Sandwiches or we sometimes replace pickled onions with peach salsa in this Feta Cheese Sandwich recipe. If you love to top your fish with salsa, I recommend that you try this one on Pan-Fried Salmon. What is your favorite recipe to pair with peach salsa? I’d love to see your suggestions in the comments section below! 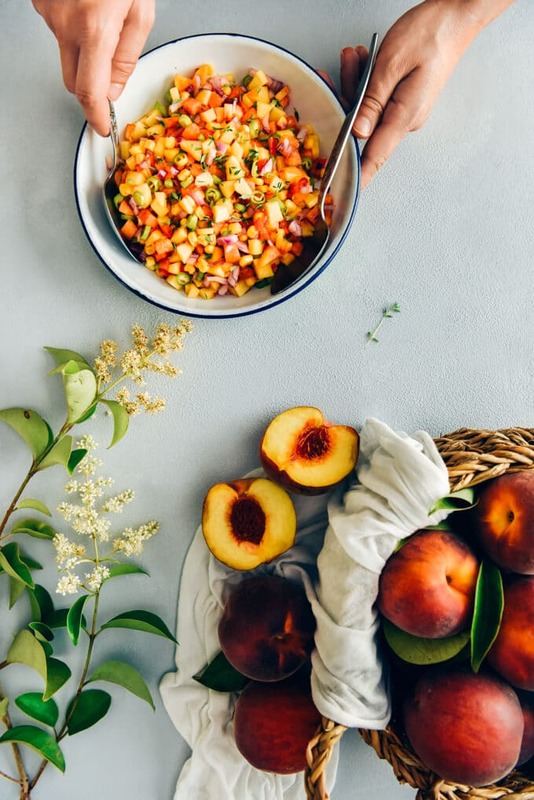 Not an overly sweet fruit salsa made with fresh peaches, corn, tomatoes, peppers and onion. Whisk together lemon juice, olive oil and salt. Pour it over the salsa and give it a good stir and serve. It tastes great on the day it is made but you can keep the leftovers in a container with a tight lid for another day. Such a colorful and refreshing salad! I’d add some pickled jalapeño in it. Can’t wait to try it in my favorite chicken wraps. Thanks for the idea!